Having a Christmas themed profile pic on your social media profiles (Facebook, Linkedin, Twitter & Instagram) is a great way to start conversations and increase your business reach whilst spreading a little joy during the season of goodwill. It’s especially useful for local businesses who gain customers through being known and well liked within the local community. However, it’s all too easy to take a bad Christmas selfie, one which doesn’t show off you or your business in the best light. (Read the blog “Why Do You Need A Professional Headshot?” to find out why you should avoid this). 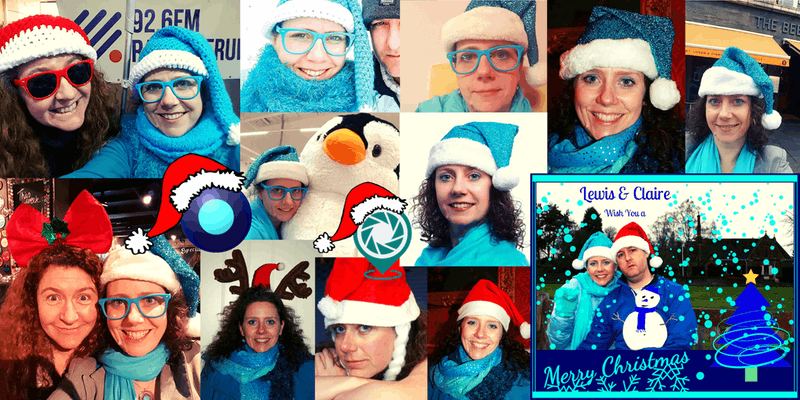 The header image above shows some of the informal Santa Hat profile Pics Claire Boyles has posted over the last 10 years in business. The risk of unprofessional Christmas selfies is removed by having a professional photographer take the best possible photo. A professional headshot often costs £80-180 which is a big chunk of your marketing budget, especially when you’re only going to be able to use it for the month of December (If you don’t age quickly you could get away with using it quite a few years in a row!). To make it easier on your budget we’ve organised a day of Santa photo shoots with a brilliant local professional Photographer Jo Hailey! Jo is better known locally for catching the images of Striking Places (She did the Google Street View inside of Westminster Abbey and many local businesses all over the UK). However, what’s less known is that she also is highly skilled in capturing the best images creating photographs of striking people too! (This is a professional headshot she did of me (Claire Boyles) recently. We’ll provide the santa hats, reindeer antlers, elf hats, and a variety of Christmassy head ornaments. You simply choose which ones you want to wear. We have Santa hats in a variety of colours so you could choose one which matches your business brand colours! If you’re as mad about Christmas as we are you probably have your own, so feel free to bring those too! You’ll receive these electronically and will be able to post them in plenty of time for Christmas (Some people like to extend Christmas to the whole of December!). If you’d like a printed photo to take home with you with your printable file, these are £15 each. If you’d like us to make a custom designed Christmas card, we can create a design in your brand colours and with your business logo and your new Christmas headshot! Organised by Success-Matters.com, delivered by Striking Places Photography, venue sponsored by Torrington Hall.